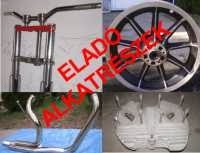 Harley parts for Sale!! Alkatrészek eladók!! Old style leather tool bag. Inspiration for new leather project. New leather spring seat for Harley. New used parts for my bike. '81s Honda XL500 rigid bobber from my old bike.